Today’s meeting began innocently enough with President Mary Straus getting things started by leading the pledge. Regular readers are no doubt aware that the Marana Rotary Club is a “singing” club…well, today’s song was “Good Night Ladies” as chosen by exchange student Matus Bogar with special assistance from past President Maeve Johnson. We were feeling as good as can be expected with our performance until PDG Randy Brooks casually mentioned that singing is thought to be a turn-off to younger Rotary folks. Then ensued a general discussion on why we sing, how it got started in Rotary, and why Vince Lombardi had the Packers sing (to bolster their self-confidence). President-Nominee Tony Hunter felt that we need a more expansive song list. Or something in tribute to David Bowie. Hmmm. Perhaps a rapping Rotary Club is in order? Denise Coronado seemed up for that. Aleta Wiener, President-Elect of Dove Mountain Rotary, came to invite us to their annual fundraiser on Sat Feb 6 2016, which this year will have a Mardi Gras theme and feature Dixieland and Cajun music by the Tucson Jazz Institute. Tickets are $60 per person. Dan Contorno reminded everyone that the next Poker tournament fundraiser still has room for more! And that planning for the upcoming Tour de Cookie is coming along. Registration may be open as early as the end of this month. This is starting to get exciting! RYLA will be held, and our very own exchange student, Matus, will be attending. Randy Brooks will be singing at Café Tremolo to benefit our Club, at 6:30pm. It’s very good news, as well: the wheelchair swing for the special needs playground at Coyote Trail Elementary is approved! And things are looking up for the Tortoise Habitat. Mary’s hard work for this playground is paying off. Well done! Like most Rotary Clubs, our meetings involve a certain amount of ritual. Today’s Happy Bucks was quite lively – Javier Teran, what exactly did you put in the coffee? John Dooling blamed his late arrival on Harold Burtzloff, through some intricate weave of logic. Harold bought a PowerBall ticket on behalf of the Rotary Foundation, which he displayed for his Happy Buck. PowerBall is at an all-time high (1.5 billion). The question: our Treasurer could not be with us today, so how should this ticket be stored? Dan’s immediate offer to hold on to it was met with a certain level of disdain, shall we say. Discussion followed. No consensus was reached. Tony’s Happy Buck was all about his ride-along with Marana Police and the remarkable things they deal with on a daily basis. But did Tony arrest anyone? Tackle anyone? Taser? Hmmm. Our very own Vanessa Ruiz gave some background on herself today, in spite of the fact that she really doesn’t like talking about herself. She’s a fifth-generation Tucsonan whose parents own an air-conditioning company. Vanessa attended Mountain View high school, Pima Community College, then worked as an emergency room technician, and bought her own home before joining the Louis Parrish real estate company two years ago. She has two boys, ages 7 and 11, who like fishing and hiking and sports. A very active family, and even Mom plays softball. 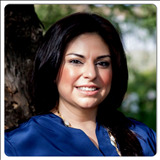 Vanessa belongs to the Tucson Hispanic Chamber of Commerce and serves on the Health and Business Advocacy committees. We are so pleased to have Vanessa as part of our Rotary family!